Seaside Book Nook: Chicken Soup for the Soul New Moms plus Giveaway! Chicken Soup for the Soul New Moms plus Giveaway! Synopsis: Becoming a mom is the most amazing event. Chicken Soup for the Soul: New Moms will delight new and expectant moms with its heartwarming and humorous stories about raising babies and toddlers. This book is full of stories by other moms sharing the wonders of early motherhood, from waiting for the baby, to those early weeks and first few years, and everything in between!" Review: This book is a perfect shower gift for the friend expecting a child. I think it is more appropriate for a first mom, but I still really enjoyed the stories and could relate to so many of them even though I already have children. One of the best thins about the book is the short stories. It is easy to pick up the book and read a story or two at a time. This is so important for new moms (okay all moms, right). This book covers so many topics: Coutdown to Motherhood, The Mom-mary Glands, Give Me Rest, The Wonder of Being a Mother, Doubts & Insecurities, Words of Wisdom, Born of My Heart, Tough Stuff, Giggles & Mischief, The Long Road, Second Time Around, Toddler Time. 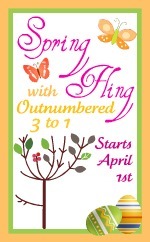 To celebrate Spring.....Outnumbered 3 to 1 is hosting Spring Fling! Spring is finally in the air and we have some great things to share with you to kick off this wonderful season! From backyard bar-b-ques and outdoor fun to Easter and Mother's Day gifts and Spring Cleaning, we've got you covered. Make sure to stop by daily to see the wonderful products we have to share with you. Of course there are a whole bunch of giveaways you can win too! The Giveaway: We have two copies of the Chicken Soup for the Soul New Moms book to giveaway to two lucky participants. To enter the giveaway leave a comment on this post telling me why you would like to win this book. This step must be done before you can qualify for extra entries. Become a follower or Googl Friend Connect of Seaside Book Nook blog (once you become a follower/Google Friend Connect, or if you already are), leave a comment on this post. Head over to Outnumbered 3 to 1 blog for additional ways to enter. While you are there, see all the other great giveaways Mel and the ladies have. Please leave a separate comment for each extra entry, otherwise it will just be counted as one. Your loss. This giveaway is open to residents of the US until April 18th at 11:59 pm. Check out a complete list of giveaway rules.
. I have a young daughter(turning 6 in June) and maybe there would be a story we could read together. I would love to win this because I love to read. I am also a new mom to a beautiful 2 1/2 month old baby girl. :) This would be a great read while nursing. I would LOVE to win a copy of this book! I have been reading books from the Chicken Soup series for a long time. I am the mom of 2 great kids so this book is even closer to my heart than some of the other books. Thanks for the chance! Hex, A Witch and Angel Tale plus Giveaway!